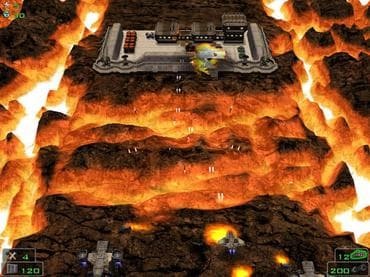 Insane space shooter with new twist. Aliens conquered Mars and are building an army to invade Earth. Destroy alien spaceships, plants, buildings and everything you see! It is 2074. Astronomers from around the world are watching an asteroid crash into the surface of Mars leaving a huge crater. Clouds of dust and vapor hide the surface of the planet for several long months. Communication with all Martian research stations is lost. When the clouds clear away, people send new spaceships to the Red planet. The spaceships send back shocking news. Hundreds of plants producing arms have been set up on the maimed surface of Mars. Thousands of machines stock the mineral deposits that had been brought to the surface by the massive explosion. A huge geothermal unit is running in the Center of the crater. Its energy creates a protection shield that extends beyond the planet's atmosphere. The objective of the unknown aliens is absolutely clear: they're building an army to conquer the Earth! So people are sending a small spaceship to the Red planet with one mission: blow up the shield generator so they can launch missile attacks from the orbit. The spaceship will have to land in an isolated area, and then try to infiltrate into the alien conspiracy. You are the commander of the spaceship, and the fate of the Earth is in your hands! Download free full version game and start your mission! If you have questions about Incinerate game, please contact us using this form.